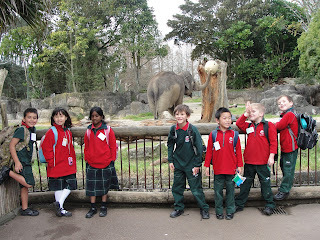 We went to auckland zoo two weeks ago. First we saw the red panda witch stood up. Then we went to the tigers the tiger was huge it came right up to the glass. We also saw the elephant Pooing in the middle of our photo. It looks like room 11 had fun at the zoo!!!!! Wow! Mrs King ! You must have a busy time changing the background! I love the pictures that you had taken. I like that you found the best place to take that photo. Not just my one that I left you, my whole class did more than one for you. I hope you like our comments that we left for you. we went to the zoo and we had a lot of fun there !